Select from the installation gallery list below to see more of our work. Embury, Ltd. has been providing solutions in design, sales and service of library and institutional furnishings and accessories since 1988. We will help you find just the right color, pattern, and graphic that fits with your library or facility’s style to create an ambiance that is functional and inviting. Public Libraries are a hub for multi-generational learning and collaboration. As a community resource libraries offer access to information, technology, social gathering, and creativity to the entire community. As public library have transformed the need is even greater for furnishing that will support their mission. Embury, Ltd. can bring to your public library the design and style needed to support the diversity of your patrons. Whether you need to update lounge areas to support solitary readers or create new collaborative areas we are here to assist. Creative solutions allowing you to provide engaging and functional areas for children setting the groundwork for a lifetime of learning is just one of the areas that we can help you with. School libraries are an integral part of the learning system and becoming the social hub of schools. 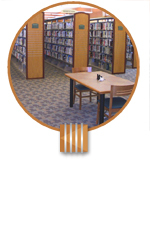 Embury, Ltd. can help create your K-12 Library or Media Center to fulfill the needs of today’s student. Incorporating the “zones” concept we can help you create functional area such as welcome/information, display, classroom, reading/quiet areas, independent study, collaborative areas, book stacks, café, or makerspaces and more. Furniture solutions that are functional, mobile, friendly or customized allow you to create the atmosphere you and your students are looking for. 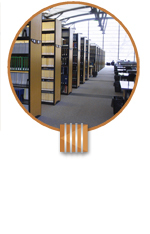 University libraries provide an essential service to student and faculty. 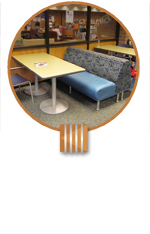 Embury, Ltd. can provide furnishings that foster higher education by supplying you a wide variety of lounge furniture, shelving, and even custom solutions that caters to students, encouraging them to better utilize your library facilities. Providing furniture that is flexible, durable, comfortable, and attractive will support the changing technology and interest of your students. We can provide consultation services to help you analyze your existing furniture and suggest changes so that your library can optimize its functionality. If major renovation is called for we can assist you by developing a master plan that will keep you on track. 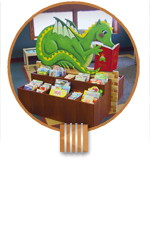 An important area in any library is the designated Children’s Area. This is where the joy of reading and learning can foster a lifelong love of liberties. Embury, Ltd. offers absolutely everything needed to furnish you library with a children’s reading and interaction space that will captivate the younger minds visiting your library. 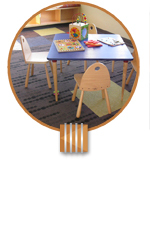 Embury, Ltd. can supply your children’s area with furniture that is fun, colorful, functional and even educational. We offer Interactive games, specialize shelving, custom book bins, and of course tables and chair options that help keep children comfortable and happy. Visually stimulating Children’s area often calls for our custom wall murals and decorative painting services. Many libraries are finding benefit in providing a special area designed just for teens. Embury, Ltd. can provide you with furniture in the style that will appeal to your teens. Comfy and functional seating areas, workstations, tables, and displays cater to the aesthetics of your teenager. Embury, Ltd. can help you create a space where teens want to hang out. Not all product solutions can be found in a catalog, Embury, Ltd. has developed the resources that allow us to offer custom solutions to your most challenging needs. 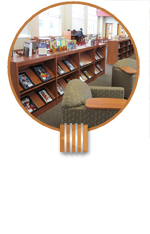 Our custom design options cover everything you could need for your library including desks, kiosks, display, book bins and shelving endcaps. Bring us your unique challenges and we will help you find solutions.